With these color-coded tiles, students can manipulate parts of a whole to see how they relate to each other. 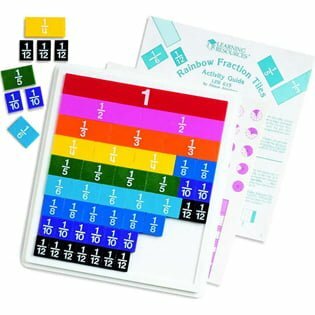 Visualize fractional concepts with this set of 51 color-coded proportional plastic pieces. Represents 1 whole, 1/2, 1/3, 1/4, 1/5, 1/6, 1/8, 1/10 and 1/12. Includes 9″ x 10″ plastic tray, Teacher’s Guide and two sheets of stickers. Color-coded to correspond to all Rainbow FractionÂ® products.